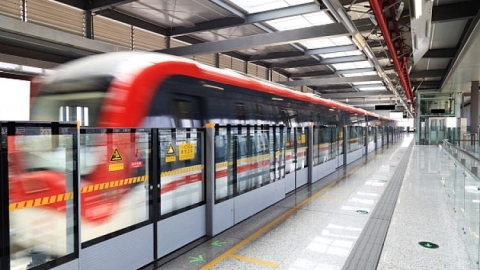 The wait time for Metro passengers traveling from Sheshan Station to Yanggao Road M. Station on Line 9 between 7:30am to 9am on workdays will now be the shortest of all Metro systems in China. It will be reduced to one minute 55 seconds from two minutes and 13 seconds from tomorrow. This is thanks to the deployment of 12 new trains, increasing the number to 78. During the same time, but in the opposite direction, the wait time from Yanggao Road M. Station to Sheshan Station will remain three minutes. During the morning rush hour on workdays, the wait time for trains from Songjiang South Station to Sheshan Station will be reduced to three minutes from three minutes and 20 seconds, while it will remain the same in the opposite direction. From 5pm to 8pm on workdays, the wait time for trains from Yanggao Road M. Station to Sheshan Station will be reduced to two minutes and 30 seconds from three minutes. Line 9 carried almost 1 million passengers in September.